In our new weekly column, Back Of The Net Ltd round-up the weekend’s football in Sussex and Surrey. Since the amalgamation of AFC Uckfield and Uckfield Town in 2014, AFC Uckfield Town have seen massive improvements. Last season, the U’s finished in fifteenth position in the Southern Combination Premier Division with 33 points, following promotion in 2015. In addition, over the summer they have strengthened their squad in every position with new signings. On Saturday 13th August, the U’s hosted Lancing FC who completed last season in the top four of the Southern Combination Football League Premier Division; undoubtedly a tough fixture to begin the campaign! Nonetheless, Uckfield had a strong start to the game and looked on top. New signing, Andrew Dalhouse held the ball up well and got himself beyond the Lancing backline on numerous occasions. With only three existing players in the starting line-up, the U’s took a short while to find their shape and in the midst of settling, their opposition took the lead. Lancing’s lead however, did not last long as a towering header from Dominic Clarke, paved way for a tap in, scored by Matt McClean. In the second half, Andrew Dalhouse found himself isolated up top when two team mates were shown red and Shaun Loft was subbed off with injury. The game quickly went from bad to worse, with a devastating own goal in the eighty-eighth minute and a point slipped through their fingers. Committee Member, Graham Sullivan: “We were disappointed to lose experienced captain Shaun Loft to injury in the second half. His departure had as much impact as the sending offs to be fair. If it’s a serious injury, it will be a big loss”. Having not won a game on their travels for 495 days, Bolton secured their first away win at Kingsmeadow. League One newbies, Wimbledon had the ideal start to their campaign, with an early goal scored by Andy Barcham. Bolton, however, grew in stature and thrived on Wimbledon’s mistakes. Gary Madine caught out keeper Ryan Clarke, with a left-footed shot which dribbled the ball over the line, equalising eleven minutes before half time. With twenty minutes remaining, Bolton completed their turnaround and secured their first away win in over a year. Goal scorer, Madine delivered the ball to Liam Trotter on the far post, who found the back of the net with Bolton’s second attempt on target. Despite the Don’s unable to maintain their lead or make a comeback themselves, there are huge positives to take from their performance. Wimbledon maintained 53% possession and had eleven shots in total, five of which on target, comparing to Bolton’s two, which unfortunately both beat Don’s keeper, Clarke. Last season Merstham completed their first season in the Ryman Premier League, following promotion with a top half table finish, positioning tenth. In addition the Moatsiders, lifted the Surrey Senior Cup, knocking out Vanarama National League side Woking FC along the way. Their opponents, Billericay Town pipped them in the previous campaign, finishing one position above, in ninth place. An equaliser from the penalty spot concluded Merstham’s opening game of the season, Pat Cox converting to earn the Moatsiders a point at Billericay Town. Phil Wilson; former Dulwich Hamlet goalkeeper, Dan Bennett; ex-Kingstonian player, Xavier Vidal who arrived from National League South side Welling United and; Alex Addai, former winger for Wingate & Finchley, were among the list of debutants. Manager, Hayden Bird believes that “a point was fair.” In an interview, he stated, “We had a great opportunity to win the game in the last few moments when Dan Bennett hit the post, however, on reflection of ninety minutes, a point was the right result”. The match was physically challenging, Bird comments: “You have to equip yourself physically and physically we were strong.” The manager also highlighted many key performances, such as Marc Okoye doing “very well at the heart of our defence”. Bird also added “Pat Cox physically gave them all sorts of problems up front and Tom Kavanagh was combatted in midfield”. After a goalless draw against promotion rivals Derby County on the opening day of the season, Brighton & Hove Albion have since thrashed Colchester United 4-0 in the EFL Cup, as well as, defeated Nottingham Forest 3-0 on Friday night. Glenn Murray informed everybody of his return to the club with a brace, scoring the second and third goal after Anthony Knockaert’s opener. The former Crystal Palace striker almost completed a hat trick, being through on goal in eighty-second minute. Henderson however, was alert and deprived Murray of his third goal. Brighton host Rotherham on Tuesday night and take a trip to the Madejski on Saturday 20th August to play Reading. It was a poor season for Chipstead last season, finishing just one place above relegation from the Ryman League South. After the departure of manager Craig Tanner, former player Anthony Williams stepped in to help guide the club to a better finish this year, stating “we are all working very hard on and off the field to continue moving the club forward”. The Chip’s campaign began at home to Lewes, and they will be disappointed not to have capitalised on a good pre-season & first-half as they ultimately lost 2-1 in a hotly contested game. Chipstead got off to a strong start, creating chances from the very start of the game, and only had to wait until the 16th minute before winger Erivaldo Felix broke through the defence with a mazy run and unleashed an unstoppable shot beyond the keeper. The Chips continued their dominance and were well deserved leaders at half time. In the second half, goal scorer Felix had to be taken off after a heavy challenge, and keeper Sheikh Ceesay was needed to preserve their lead with a point blank save. Lewes were becoming more dangerous as the half progressed, and equalised on the hour after Dan Perry was clipped in the box, and converted the resulting penalty. Chipstead continued to create chances, but it was Lewes who dealt the final blow late on, with James Hammond reacting quickest to turn in a corner. Manager Anthony Williams was full of praise in his post-match interview, saying “we can take a lot of positives from the game, I think Lewes will be top three this year. We’re chuffed with what the boys gave us first time out. For a brand new side, it was very good”. Williams pointed out the injuries to his players during the game, in particular Jason Henry “his work ethic is phenomenal and it’s unfortunate that we had to take him off, the changes we had to make lost a bit of our pace in the side”. After winning promotion to the Southern Combination Football League last season, Crawley Down Gatwick have had a busy summer recruiting for this level, whilst maintain the bulk of their successful 2015/16 squad. Unfortunately for the Anvils, it was not the opening day they were hoping for, losing 4-2 at home to Newhaven. It was a highly competitive game, and the hosts even led 1-nil at half time, but they could not handle the pressure of forward Lee Robinson, who bagged two goals for the visitors. Manager, Paul Cooper: “I think we can be satisfied with the performance. One nil up at half time and could have been more- we had a very good penalty appeal turned down. Second half we switched off at the start and Newhaven came out on top, if we had stepped up in this time and focused for the full ninety minutes, the score line would have been different. Plenty of positives for us to take from the game going forward against a team who finished third last season and will no doubt be up there again”. Up next for the Anvils is a trip to Arundel FC on Tuesday night, who lost their opening fixture 5-0, followed by a trip to Corinthian Casuals in the FA Cup. Cooper commented: “To say we are the under-dog would be an understatement. Everyone will be expecting Corinthians to go through, with the pressure on them to knock us out being in the division below them”. Crawley’s dismal end to last season’s campaign, finishing in 20th place after eight consecutive defeats, left the Red Devils being touted as favourites for relegation this term. New coach Dermot Drummy had plenty of work to over the summer to restore the faith of the Reds fans. Under the new ownership of Turkish businessman Ziya Eren, it certainly has been a busy summer at the checkatrade.com stadium, with thirteen players departing and twenty coming in so far. A busy pre-season schedule gave Drummy’s new-look squad the time to gel together ahead of their opening League fixture, which ended in a hard-fought 1-0 victory over Wycombe Wanderers. Crawley hoped to build on this positive start as they travelled to Doncaster Rovers on Saturday. The visitors took the lead after twenty-six minutes after James Collins grabbed his first goal for the Reds, tapping in Jason Banton’s excellent low cross. They went in ahead at half time looking good for their lead, and would have been disappointed they couldn’t double their lead after a poor first half Rovers display. The hosts were much improved after the break, and equalised 4 minutes in to the second half after James Coppinger superbly fired in Matty Blair’s low corner. Doncaster pushed for the winner, but Crawley’s defence were resilient and they went home with a well-deserved draw. Avoiding defeat in their opening two games is already a sign of much improvement from Crawley, and fans can perhaps hope to be looking up the table rather than down. After the game, Drummy praised the team’s mentality, “it’s fantastic, teams will come to Doncaster and have a tough time, I think we defended admirably”. He was also quick to praise the travelling fans, who he is beginning to win over with some impressive performances; “they came all this way and the least we can do is send them home with a smile on their face”. Dorking Wanderers were excellent last season, just missing out on promotion after losing to Faversham Town in the play-off finals. Wanderers opened their campaign on Saturday at home to Greenwich Borough, and it was back to business as usual as they came out 1-0 winners. It wasn’t easy for them, however, with Greenwich Borough dominating the chances in the first half, coming closest when striker Glenn Wilson blazed his header over the bar from 5 yards out when it really was easier to score. Reaching half time goalless, Dorking considered themselves lucky to not be behind. They were rejuvenated, however, in the second half and they dominated throughout. The deadlock was finally broken with a wonder strike for last season’s top scorer Tom Tolfrey, who took the ball into his feet just inside the 18-yard box, neatly turned and powered a shot into the top corner which was enough to beat any keeper. Wanderers continued to dominate the possession and did enough to see out the victory. Manager, Marc White was happy with the three points, but feels there is room for improvement, “You would have taken 3 points first game of the season. It’s one of those games you just want to win. The 3 points were what mattered, luckily, because the performance was not great. My issue is that they created enough chances to win a game, but they didn’t take them. Ironically first half I thought their keeper kept them in it, he made some really good saves from McShane and Tolfrey, and their bad finishing kept us in it. When we scored we were on top. We’re short of games really, we haven’t had a long pre-season”. Last season, Lingfield finished in eighth position in the Southern Combination Football League Division One with 48 points; only four wins off promotion places. Over the summer, the Lingers have been working on strengthening the core of the team, in order to contend for promotion this season. Lingfield encountered newly relegated, East Preston on Saturday 13th August which resulted 4-1 to the hosts; a game to forget for Lingfield! Before the interval, intensity was too low and the players did not control the pace of the game, which resulted in the Lingers conceding four easy goals. The second half was more positive, and the players showed more energy, passion, desire, self-belief and commitment. Perhaps bad beginnings make happy endings? The club have stated “every player gave 110% and put themselves on the line”. Lingfield’s Tuesday night game against Seaford Town has been postponed, which will give the squad more preparation time ahead of their cup fixture against Hailsham Town on Saturday 20th August. Dorking finished last season in eighth position in the Combined Counties League Division One, with 46 points; their first top ten finish since relegation from the Premier Division in 2013. A summer of signings and the excitement of a new manager has spirits high in the Mole Valley district. For the first time in years, over half of Dorking’s squad are from Dorking and neighbouring villages. Club Director, Roger Mahony: “We brought in a new manager with a brief to recruit a youthful team, blended with experience that local people will identify with”. The Chicks first game of the season saw them play Farleigh Rovers, who completed last season, eight positions lower in sixteenth; a fall from grace from their champion positioning in 2014-15. Despite winning the league, the ground requirements needed to progress to the Combined Counties Premier Division were deemed inadequate for promotion. Danny Fox’s first league game in charge resulted in a frustrating narrow defeat. From the whistle, Dorking dominated the field and fared the better side. A clearance off the line and two disallowed goals for the Chicks, had Rovers counting their lucky stars. In the last ten minutes of the game, Dorking’s wastefulness resulted in a late winner, scored by Dominic Boman-Flavell and ensured 3-points for the hosts. Mahony “It’s disappointment right now, but, on reflection there’s plenty of positives. Our keeper didn’t have a shot to save in the first half! Two of the best performers were 16-year-old Jack Wisbey and 32-year-old Russell Hartt, both of which local players, a blend of youth and experience which shows great promise for the future”. The form has indeed continued into this campaign, Redhill secured their first win of the season, defeating Frimley Green 2-nil. Goals from Kerry Kedze and Luke Jones in the 75th and 82nd minute ensured an exciting second half. The Lobsters had a few chances in the first forty five minutes, Kedze shooting the ball over the crossbar approaching half time and Halsey finding the post after a Brewster free kick. Redhill play Chessington & Hook United on Tuesday evening and host Lewes on Saturday 20th August in the FA Cup. The Lobster’s progress to the next round after their convincing 4-1 win over St Francis Rangers earlier this month. South Park secured a decent, mid-table finish in their second spell in the Ryman Isthmian One South following promotion in 2013/14. Manager, Malcolm Porter: “As soon as the 2015/16 season finished, work started on developing our squad for the forthcoming season. Our number one priority is to keep the mainstay of the squad and where necessary specifically target new players that will come into the first team squad and make us more competitive”. Unfortunately, South Park enter the 2016/17 campaign on the wrong end of a 4-1 score line. Their opponents, Hastings United currently occupy top spot of the table on goal difference, and demote the Sparks to the bottom. South Park took an early lead through Joe Jackson who scored from a low cross. Hastings however, were quick to retaliate and the deficit ignited momentum, and more and more chances were created. Steve Watt levelled the game with a goal from outside the box, which was followed by a successful header from Jay May. Steve Watt added another to his tally before Matt Bodkin made the final score 4-1. On Wednesday night the Sparks host Corinthian-Casuals at the King George’s Field. Horley Town finished last season in sixth position with 72 points; their highest total on record. In a league where promotion is only rewarded to the champions, the Combined Counties Premier Division mounts pressure from the get go, on its twenty three teams. 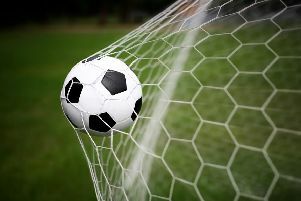 In their first game of the season, Horley Town took the lead twice against Colliers Wood, however equalisers from their opponents held them to a 2-all draw. Showing promise, 16-year-old summer signing, Tate Greenaway scored on his debut league game, and opened the score line. Saturday 13th August, saw the claret ‘n’ blues take on AFC Hayes, who won their first fixture of the campaign 3-2 against Edgware Town. Horley Town dominated possession throughout the first half and their efforts were rewarded in the twenty fifth minute, when Captain Adam Pullin found the back of the net. Horley’s breakthrough completely unsettled AFC Hayes and shortly after the first goal, an own goal from a free kick taken by Ryan Brackpool, doubled their lead. Seven minutes later, Kyle Hough was denied in a one-on-one with goalkeeper, Bobby Kharia, however buried the rebound, making it 3-nil before half time. Half time substitutions of key mid-fielding players, including Ben Herdman, Rob Burbidge and captain Adam Pullin, combined with winning complacency changed the tempo of the second half, contrasting completely to the first. AFC Hayes with a three goal deficit quickly closed the gap by one, with an early goal; a penalty scored by Jordan Berry. Frustrations high on both sides, passes became easily intercepted and possession more even. Manager, Ant Jupp: “First half was very good. We started with the same team that started on Tuesday. At half time, unfortunately, we lost a key player, Ben Herdman due to sickness, and from that we totally lost shape. Rob Burbidge and Adam Pullin also had to go off shortly after, so the system we we’re trying to play was gone. Really happy with the first half performance, but second half, not good enough”. Returning to the Ryman League for the 2016/17 campaign, the Hornets started their season with a 3-1 defeat at home to Carshalton Athletic. The visitors, however, finished 10th in the Ryman South last season, so Dominic Di Paola’s team were clearly the underdogs. Mickel Miller opened the scoring for Carshalton as Matt Whitehead’s slide tackle only gave the ball to the goal scorer. Sequoia Kaba made the score 2-nil by half time, and once more scored in the seventy-first. Horsham were determined to score, and the goal finally arrived in the ninetieth minute, a strike from George Branford. Horsham visit Greenwich Borough on Tuesday night and travel to Sevenoaks on the 20th August in the FA Cup. After finishing champions of the National League, newly promoted Sutton United face a tough season in the highly competitive National League. It hasn’t been the best of starts for the U’s, losing their opening fixture 3-1 at home to Solihull Moors, then drawing away 1-1 with Forest Green Rovers. Still in search of their first win of the season, Sutton faced the tough task of travelling to high-flying Lincoln City, who had won their opening two games 3-1 and 6-1. Sutton, however, got off to great start, and went ahead after twenty-three minutes thanks to a terrific free kick from Dan Wilshart. Sutton then looked to be in complete control after Lincoln had Bradley Wood sent off after an off the ball altercation with former Crawley Town striker Roarie Deacon. The hosts equalised, however, six minutes into the second half through Sam Habergham’s long-range lob. The U’s then made their numerical advantage count, with James Collins heading in on eighty-three minutes, and Deacon sealing the three points in injury time. Manager Paul Doswell comments “We’re really pleased to get the result at Lincoln - I think the third goal flattered us a little, and I was a bit disappointed in the way we played at the start of the second half, as I felt we could have played better and passed the ball better, but having said that the lads have put in a fantastic week’s shift for the football club and have come away with a very good result today”. Reprieved of relegation last season, the Hillian’s have wiped the slate clean, starting afresh this campaign. Several additions to strengthen their existing squad have been made, which include re-signings, experienced signings and a new team captain. Manager, Ian Chapman’s ultimate goal is to remain in the Ryman Premier League however comments “it would be nice to break into the top 14”. Burgess Hill travelled to Suffolk for their opening game of the season, and returned home with a hard-fought point. Needham Market fared the better side in the first half with their direct football and offensive style of play. After only ten minute, Burgess Hill found themselves 1-nil behind, thanks to Colchester United loanee, Jack Curtis capitalising against the run of play. At half time, summer signing Tyrell Richardson-Brown came off the bench and showed immediate effect. His pace and quick-thinking helped him get behind the Needham defence, in pockets which the Hillian’s failed to find in the first half. Likewise, Needham made substitutions and the game became much more open. Burgess Town’s equaliser came late in the game. With only six minutes of play left, Richardson-Brown proved to be a “super sub” when he escaped his marker and found the back of the net. Manager Ian Chapman: “A point away from home is a good start… Tyrell showed good pace and composure for his goal and all the players today did OK. Games come thick and fast so when we get the time with players on the training ground, as we have this week, we work hard and make sure we get better in all areas”. Promotion is the target for Oakwood as the side finished third in the Southern Combination League Division One in 2016 and 4th (although it was called Division Two) in 2015. Frustratingly, both positions were only one place off a promotion spot, so Mark Gilbert’s side will be hungry for success this campaign. Despite a strong performance, the team can improve ahead of their clash with Mile Oak on Tuesday night. According to Ferrar “concentration levels” is something which the squad will work on as they gave away several fouls on Saturday. Three Bridges will be looking to improve on their mid-table position from last year, after what was an injury-hit campaign in the Ryman League Division One South. Manager Paul Faili bemoaned the injuries of last season, and they were especially hit upfront, often having to play without a recognised striker. There is much more optimism this year however, having strengthened the squad in all areas, as they aim for a top nine finish. The Bridges’ league campaign began with a disappointing 0-0 draw at home to Chatham Town. New Devon Fender, who scored over fifty goals last season, was unable to help break down the Chatham defence and get them their desired opening day win. Three Bridges will look to improve on this result on Tuesday as they travel to Sittingbourne. Faili has expressed his satisfaction with his new signings, and will be confident they can pick up all three points against The Brickies.